TOKYO — In the month before he leaped to his death from a roof at Subaru’s assembly plant in central Japan, the veteran risk-assessment worker logged 105 hours of unpaid overtime for the carmaker. According to an attorney for his family, the workload was more than the Subaru factory employee could take. Standing seven stories up that chilly December morning in 2016, the 46-year-old father of two text-messaged his mother: “Please forgive me for going before my parents. I can’t find a way to overcome the current situation.” And then he jumped. If the worker’s untimely demise was an isolated tragedy, his grueling work regimen wasn’t. At the end of last month, responding to public accusations that Subaru perpetuates a pressure-cooker environment, the automaker acknowledged that some facilities in Japan compelled thousands of workers to forgo millions of dollars in unpaid wages by working overtime off the clock. Subaru acknowledged knowing about the problem a year ago. But the company publicly confirmed it only after the family attorney for the man who died, who described the man’s final moments, held a news conference in January to pressure Subaru for damages. It is an image that contrasts starkly with the face of Subaru in the United States, its biggest and most important market. In the U.S., the carmaker expects in 2019 to cruise to an 11th straight year of record sales. It is a brand that can seem to do no wrong, with a portfolio of bulletproof products wrapped in the feel-good vibe of its charitable “Share the Love” marketing campaigns. The simmering problems are now beginning to worry some U.S. Subaru retailers and company managers, according to internal documents seen by Automotive News. Some of their unease focuses specifically on whether the pressures might affect this summer’s planned production launch of the next-generation Outback crossover, an important cash cow for the brand. Tom Doll, CEO of the automaker’s U.S. subsidiary, Subaru of America, acknowledged in an interview last week at the Chicago Auto Show that dealers had expressed concerns to Subaru in Japan. But Doll indicated that whatever challenges exist will be worked out, and he said he expected no delay in any product launch. Separate from Subaru’s manufacturing glitches, one U.S. supplier of stamped metal parts to Subaru’s vehicle assembly plant in Lafayette, Ind., has been struggling to keep pace with Subaru demand as the redesigned Outback enters preproduction. The Subaru report claimed that training for new workers at Fukai Toyotetsu was “severely lacking” with “most put on line with little to no training, creating quality and turnover issues.” Stamping has little oversight from quality assurance teams, it said. 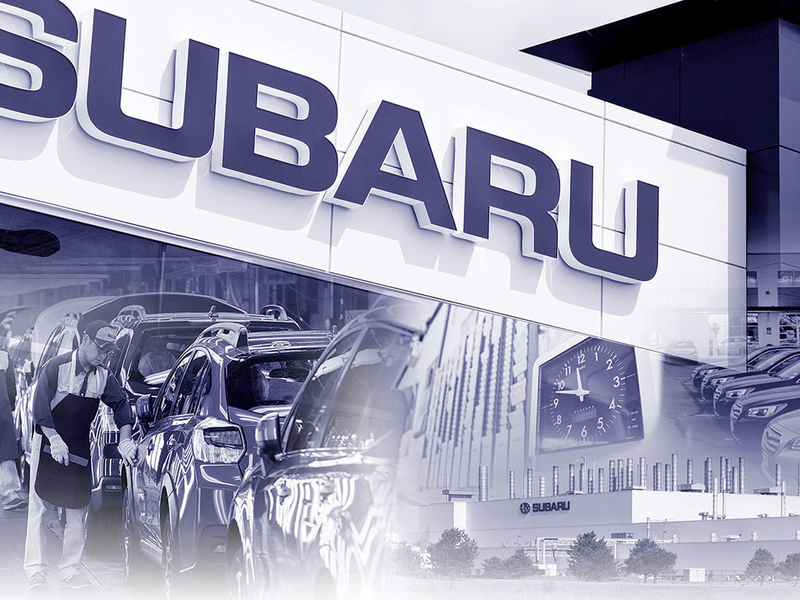 At Subaru of America, Doll said that those manufacturing issues are handled by Subaru’s U.S. manufacturing unit, Subaru of Indiana Automotive Inc.
Doll said Subaru’s Japanese parent company has been addressing quality problems. He noted that it appointed a quality czar, Atsushi Osaki, in Japan last year to lead Subaru through its problems. Subaru has paid ¥4.08 million ($ 37,300) for 18 months of unclaimed overtime, he said. The family now seeks damages, which Tamaki said can run up to $ 913,000 in Japan. Such an amount is meager compared with civil awards claimed in the U.S., Tamaki noted. The overtime owed to all those employees totaled $ 7.03 million. The local labor watchdog admonished Subaru to rectify the situation, and Subaru retroactively paid workers last March. During last week’s fiscal third-quarter earnings announcement, Subaru cut its operating profit forecast for the current fiscal year by 15 percent, mainly because of the shutdown. “If we could get more, we could sell more,” Doll said at the time. Nakamura’s blueprint calls for lifting North American sales 20 percent by March 31, 2026, from the 768,000 it had forecast for the current fiscal year ending March 31, 2019. By that time, according to Nakamura’s road map, U.S. sales alone should swell to 850,000 vehicles, pushing Subaru to a 5 percent U.S. market share — compared with a 3.9 percent share in 2018. What happens in the U.S. matters because it has outsize impact on Subaru’s global business. U.S. sales account for 65 percent of Subaru’s global volume. Last year’s recall of the just-released Ascent, to fix missed spot welds, worried some dealers. In September’s communique to company management, the retail board pulled no punches. The retailers made several recommendations. Among them was benchmarking manufacturing problems against other brands and implementing a process for ensuring quality at lower-tier suppliers, including a stronger mechanism for dumping those that don’t perform. Another request was to adopt more stringent quality-control measures “like the ones used in Japan” for rudimentary work, such as body welds and hood alignment, at Subaru of Indiana Automotive to catch mistakes as they happen and fix them. He added that Subaru would try to make up for January’s lost production, but carefully. “Our top premise is that we will manufacture cars by ensuring quality,” Okada said.